The users of Chrome browser may find an error called ERR_CACHE_MISS along with a message called “Confirm Form Resubmission“. It will happen when they are browsing a website. The error will occur from the problems on settings and configurations, extensions, cache system, etc, of Google Chrome. If you are facing this error, then you have to try the below methods to solve your problem. The Corrupted browsing data or files in your Chrome browser may cause various issues which include ERR_CACHE_MISS error. During that time, you must clear your browsing data. First, you have to click on the control menu of chrome and select the More tools and then click on the Clear browsing data. Now you can choose the beginning of time as the time period and put a tick on all items, and then select the Clear browsing data. Now you have cleared your entire browsing data. So, you have to re-open your browser and check whether the error is solved or not. Some extensions or plugins will affect your browser and may cause an ERR_CACHE_MISS error. So, you must check your Google extensions to find the problem. First, click on the control menu of Chrome and select the More tools and then click on the Extensions. Now the list of extensions will have appeared. In that, you can find the problematic extensions by disabling or enabling them one by one. It is suggested that you have to try disabling the toolbars and ad blocking tools that you can use in these extensions can usually bring about problems. It is possible that the error results come from improper browser settings or configurations. If you don’t know the exact problem occurs, then you have to reset your browser to the default settings. First, you have to open the control menu and then click on the Settings. Now you can click on the Show advanced settings which are present at the bottom and then scroll down and click on the Reset settings. Here your browser settings are reset and now you have to check whether it fixes the error. If an earlier version of your Chrome browser can contain the bugs which produces the result of an ERR_CACHE_MISS error. You have to fix problems of this kind of errors by upgrading your browser to its latest version. Now you can check whether the error is gone or not. 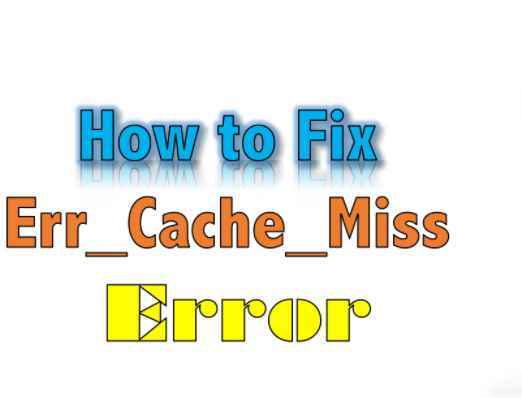 If you face an ERR_CACHE_MISS error, then you can use the development tool to disable the cache. Initially, you have to press Ctrl + Shift + I keys and then press F1 key. Now you have to Scroll down to find the Disable cache in the Network section and Check this item. After that, you can reload the page and see if the problem is solved or not. Due to the improper network settings, you may face the ERR_CACHE_MISS error. So, You have to open Command Prompt to reset the settings. First, you can press the Win key and enter “cmd“. Now Right click on the Command Prompt in the result and then select Run as administrator. Once you have done, Restart your computer and then you have to open your browser and check whether the problem is solved or not. Best VPNs to Use for Your Daily Works?